Maximum forex beginners when take their first step in forex technical analysis, they get introduced with the popular Relative Strength Index indicator. When I was first introduced with RSI indicator, I though myself that forex trading would be very profitable with this indicator alone. I was wrong because later I found that no indicator is alone sufficient to ensure profitable forex trades. I got a new indicator, Ehlers Laquerre Relative Strength Index(LRSI), which is introduced by John Ehlers in his book "Cybernetic Analysis for Stocks and Futures". Here, I am not focusing on the data analysis formula behind the formation of this indicator, rather I am focusing on the techniques and advantages of applying this indicator. 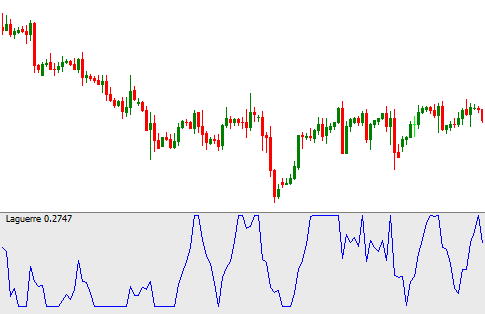 This indicator can be considered as a modified version of traditional RSI indicator. This indicator has stronger filtering to reduce the noise. LRSI indicator is a range bound indicator, ranging 0-1, hence classified as oscillator. It is more responsive with price than traditional RSI indicator. This indicator indicates the oversold and overbought conditions, and generates buy and sell signals. When the indicator reaches above 0.80 level, it is considered as a overbought condition, and suggests a sell order. And when the indicator reaches below 0.20 level, it indicates a overbought condition, and suggests a buy order. Some traders place a buy order when the indicator gives a reading above 0.80, and crosses the 0.80 line from up, and place a sell order when the indicator gives a reading below 0.20, and crosses the 0.20 line from down. The bullish divergence and bearish convergence technique of technical analysis can also be applied with this indicator, but in this case a larger range can be applied to find the divergence and convergence easily.